The HV-1 offers smooth and easy operation every time. 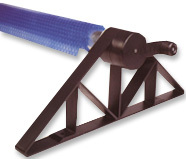 It’s low profile requires only a 17″ clearance to fit under most diving boards. The HV-1s new design features a new hand-crank for easy solar blanket removal and state of the art bearings insures one person operation. Fits pools up to 20 ft x 40 ft . Saving time and money is guaranteed. A true winner at an affordable price. 2 year limited warranty. With its state-of-the-art design, this above ground pool solar cover reel makes it easy to cover and uncover your pool. 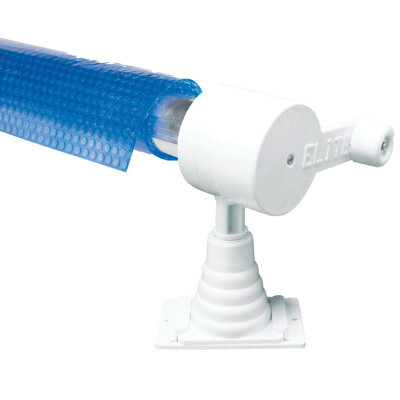 It boasts premium-strength materials for a long-life, a low-profile design that fit under most diving boards, snap-down wheels for easy removal and heavy-duty tubing to prevent sagging. Best of all, it’s easy for just one person to operate.